The Secure Power Supply function, which comes standard with the Sunny Boy Storage 3.7/5.0/6.0, can be used to power dedicated circuits in your home. Using a 3-way switch, the homeowner can manually changeover from grid power to battery power after a blackout. Even though the Secure Power Supply is limited to 3700 W, the 3-way switch can be wired to specific circuits in the home that can be powered within this limit. For e.g. 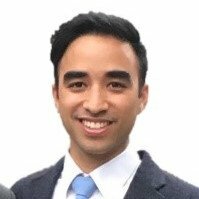 in a typical home, you could expect to power your LED/CFL lights, TV and several small electrical devices like computers, modems and possibly refrigerators depending on their startup demand. Check your home appliances to see their power usage value in Watts (W). The figure below shows how you can use the 3-way switch in a typical house. In this example, we power one of the circuits and the lighting circuit. The homeowner only needs to move the switch over when they notice a blackout. When grid power is restored, the homeowner needs to switch back the 3-way switch to the original position. 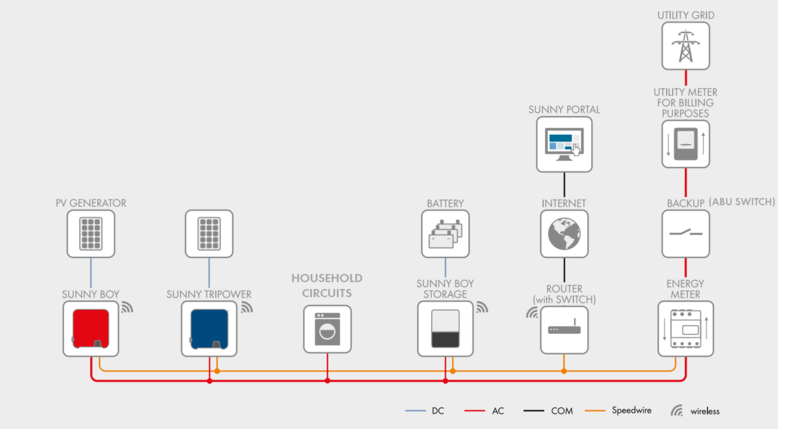 The homeowner may want the Sunny Boy Storage to automatically power their household circuits when there is a blackout. By installing the optional Automatic Backup Unit, the household loads are automatically disconnected from the grid and the loads may continue to be supplied from the battery storage system and the PV system. 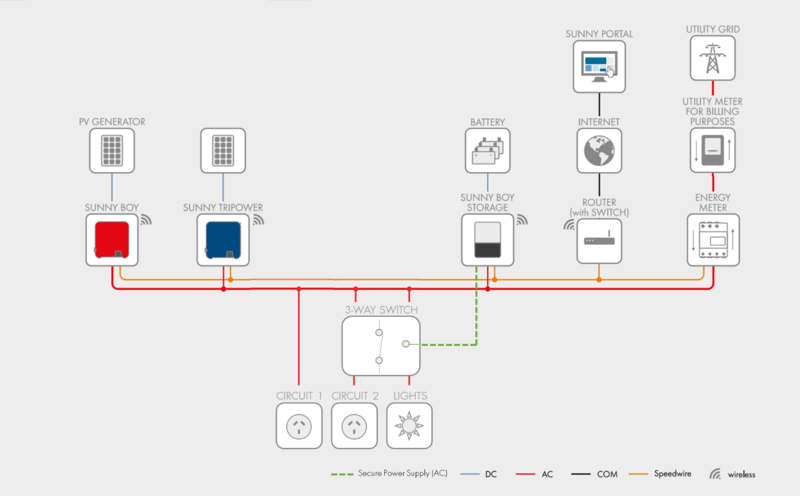 In this setup, additional power is available from the PV inverter, which allows a greater number of appliances to be powered simultaneously, and a longer period of autonomy from the grid. Backup power from your battery system is possible when using the Sunny Boy Storage battery inverter. The already included Secure Power Supply feature provides an economical way to achieve manual backup during a blackout. Alternatively, automatic backup to your full home during a blackout is possible with the optional Automatic Backup Unit.